I would like to introduce you to a very special guest, a lovely crafty friend, Laurigami. Laurigami has used the new LDRS Creative Saturated Canary image called Sweatshirt Saturday, she's one of my favourites in the collection. 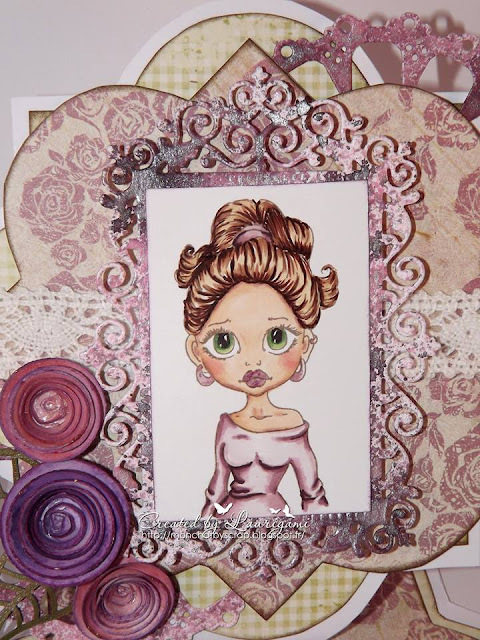 The image was layered onto the frame and 3 corners die cut which Laurigami also sprayed with the Lindy's Stampgang Sweet Treats starburst sprays, these are also available in store, links below. The shape of the card was made using the Dutch Doobadoo Square 2. Laurigami has also used the Little Darlings Lovely View, again sprayed with sweet treats starburst sprays to alter the colour. This is poking out at the top right. The rolled roses were made using the NEW Rolled Roses Die, as you can see you can make them quite large or tighter for smaller versions. Laurigami has used the Gilded Labels Die Set for the stopped of the easel card, and added more rolled roses, again sprayed with the sweet treats starburst and added kraft leaves 2. I hope you have all had a lovely weekend and for those of you who returned to work yesterday, hope it wasn't too painful!!! Time off certainly flies by. 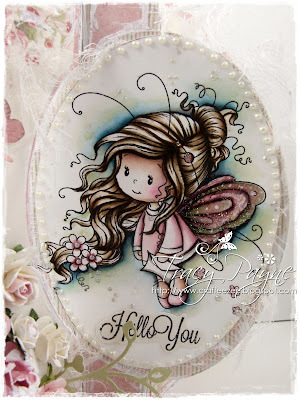 For my project today, I have used a Girly Girl image from the pictures and paper pad. 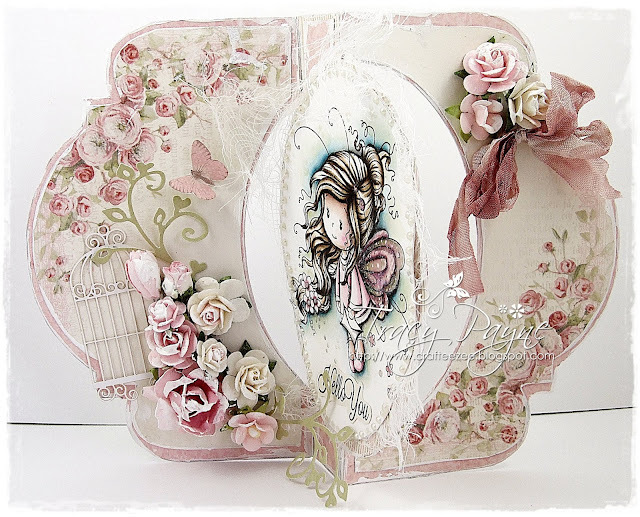 The base of the card has been created using the Dutch Doobadoo Card Art A4 stand up. 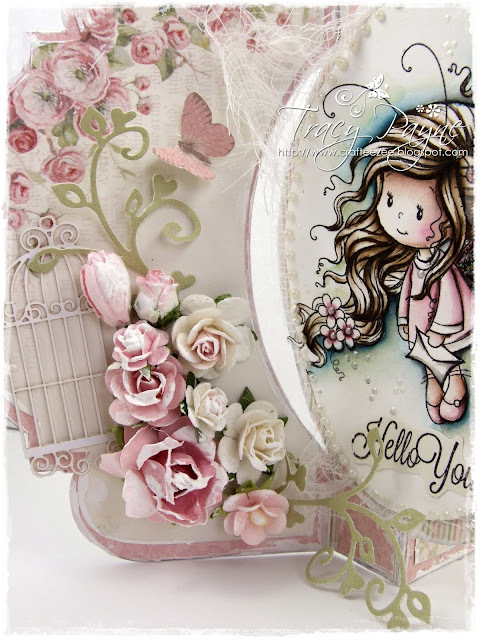 I have used an image from the Girly Girl picture pad. I cut the fence from the Spring Die set 3 times to create the fence. The image has been stamped on each edge of the square with a stamp from the Clear Doodles stamp set. I used this particular one because it reminded me of the bike chain. 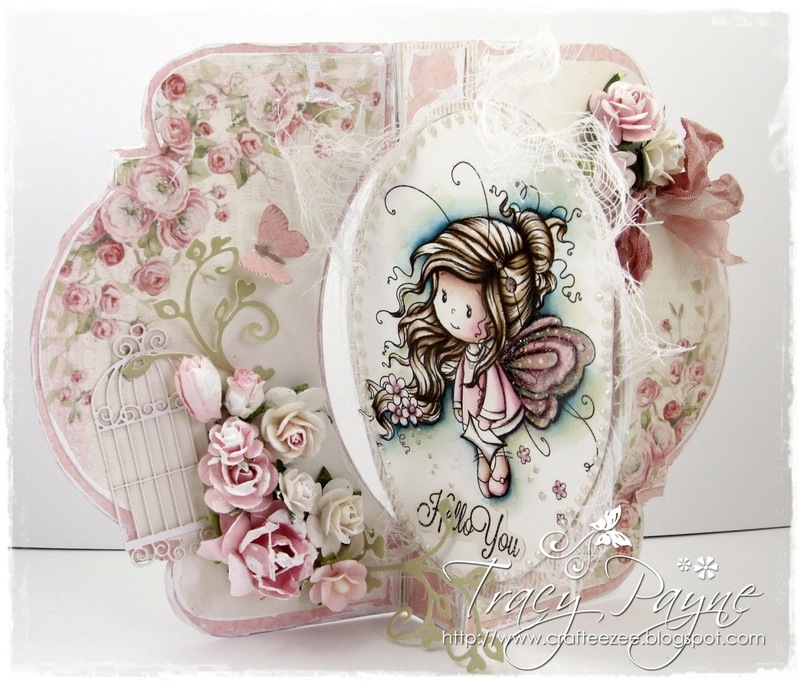 The sentiment above has been taken from The Little Darlings Vintage affections stamp set. Along the top I added the flower edge die and to each flower I added the flowers from the spring set and then added a pearl drop using the Dutch Doobadoo pearl pen. I hope you all enjoy the rest of your week. Hope you have better bank holiday weather than we did, it was a mixure of rain, wind and the odd sun peeking through. This week at LLC Sandy has set the theme of "Mythical/Magical creatures" and with the new Whimsy release now in stock at Noor Design UK I have chosen to use the NEW stamp "Cindy" who is a pretty little fairy. 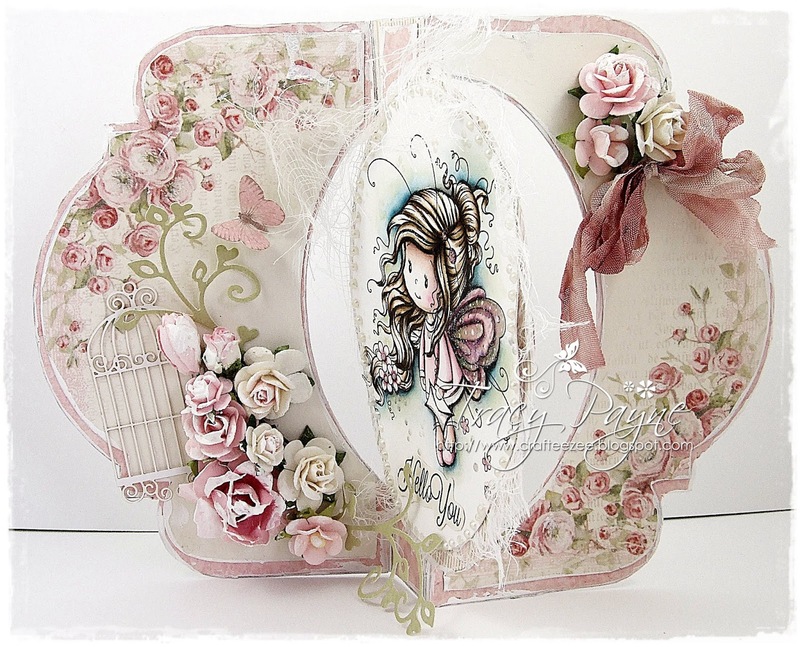 I used the Pion Design Easter Greetings available from Live and Love Crafts and used:- Pink Ornament - PD7013 to cover the base of the card and cut from the Cherry Blossom - PD7005 for the beautiful rose panels. The text "Hello You" is from the LDRS Creative Sentiment Set "You", links at the bottom. 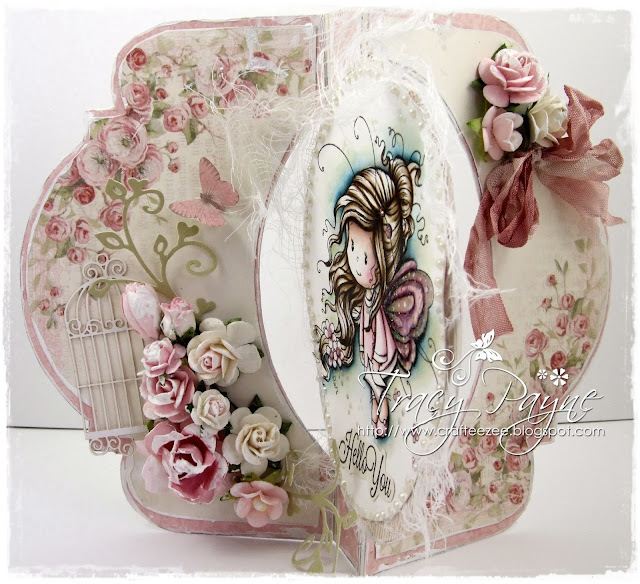 I have added a Dutch Doobadoo paper art birdcage, so delicate and pretty. I added the Dutch Doobadoo Pearl Pen in white around the image. I added a butterfly from the matching borders sheet. I added Gesso around the edges of the paper and on the flowers. I used Roses in 25mm, 20mm, 15mm and 10mm as well as a baby bud to which I added a tulip and sweetheart blossom. Hello You! I wish you a happy Easter! It's my turn to show you my latest creation and I decided to make it in bright colors and with an Easter themed image. For my card I used the Botanical papers. For making the border I used the Little Darlings Cutting Edge Border Die. Behind the image I added the Doily Die and the Viewmaster Die. The Triple Tricker Dies are a perfect addition to each card. I stamped sentiments from the Little Darlings 'You' colletion onto them. Here and there I added some Autumn Ivy Die cuttings. Thank you so much for your visit here! Have a happy day! Don't forget to join our candy to get the chance to win a fab prize!